One-on-one coaching for executives that want assistance crafting their own personal leadership stories or corporate stories for their organizations. I can help you work on stories you already know you want to tell. Or I can conduct in-depth interviews with you and your organization to find the stories you should be telling. For organizations facing a major change and needing to develop multiple corporate stories to facilitate that change. That might typically include a story to help the organization understand why change is needed, another to communicate leadership’s vision for the future, another to help the organizations see that vision as achievable, and a final story to help individuals commit themselves to new goals and hold themselves accountable for results. This is usually a multi-day event with a dozen or more key participants. It starts with training on the why and when of corporate storytelling. I then lead participants through exercises to help them choose the type of stories they will need to navigate the change. We then split into teams, each team responsible for the development of one story. Each team goes through a guided brainstorming session to develop and select the best core ideas to build a story around. That’s followed by detailed training and tools on how to craft compelling business narratives from the core ideas, with guided exercises to apply each of the techniques to the stories. The result is a suite of stories the organization can leverage across multiple touchpoints, as well as a participant group now trained in the craft of leadership storytelling. 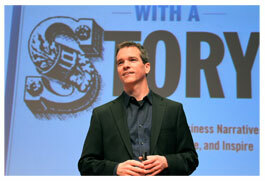 To book Paul for coaching, consulting, or story development seminars, send a message to info@leadwithastory.com.